The percentage of Development of Slums is always seen higher in developing countries. In developing countries, the major development takes place in cities, then towns. People from towns and villages surrounding the developing city start migrating the city. Since they are people with very low income or no income at all, finding a place to live in is a challenge for them. This is the major reason of why slums develop in a developing city. They use all the scrap and waste material for the construction of their homes that we discard. 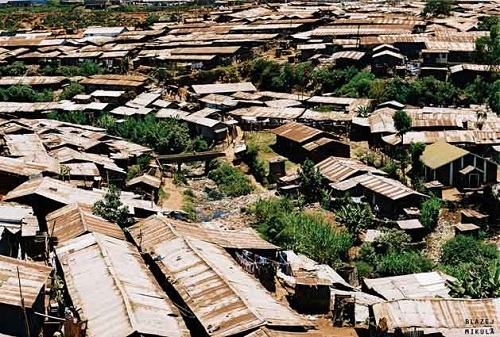 People building their huts on a land without a legal permission are also termed as slums. These are all illegal households which sooner or later are cleaned by the Government. A slum area is always underdeveloped, unhygienic and lacks important elements that are required for a hygienic and healthy living. Eradication of Slums can be achieved by providing Low cost Housing for the people living in the unhygienic slum areas. In this article, we are going to discuss these five elements which are lacking in the slum household making the living conditions harsh and difficult for people. Slum areas do not have any proper arrangement for drinking water purposes or for any other usage. They try to get water from places that are highly unhygienic but they are left with no other choice. Getting rid of this water shortage for the slums should be the main aim of the “Slum Eradication Organization”. Sufficient quantity of water should be made available for family use, at an affordable price and should be freely available without any extreme effort. Unhygienic sanitation system is another critical problem that is facing the slums and the also the urban areas. The diseases that breed in unhygienic conditions are developing very rapidly in slum areas which are later spreading in the city areas. The Government should provide an excreta disposal system especially designed for slum areas. This could be done by providing a disposal waste system either in the form of a private toilet or a public toilet shared with a reasonable number of people. People staying in slums always have that insecurity of being thrown away from the land where they are staying. Slum eradication measures should be taken by the government but in a positive way. Government should allot some land for these people with proper hygienic facilities and give them evidence of their security of their homes. Evidence of documentation to prove secure tenure status or de facto or perceived protection from evictions. It is seen that the materials that are used by the people in the slums for the construction of their houses is all trash wastage that is hazardous to the environment. They go to dump yards and gather different materials for their home construction. The materials don’t last long and also prove hazardous to the society. Therefore, usage of non-hazardous building materials should be encouraged. For that reason, the materials should be made available to them at cheaper costs or the Government must bear the expenses for the housing of the poor. 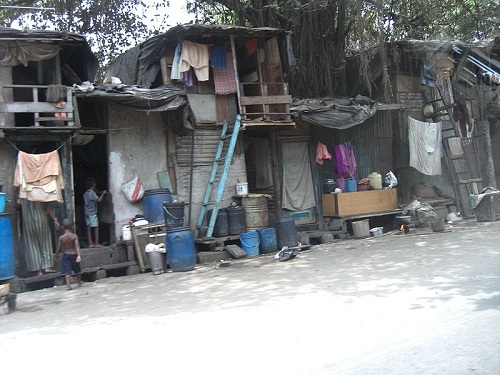 People living in slums do not have sufficient living space. They have to sleep outside their hut during night times and stay outside during the day time irrespective of the kind of climate. For this reason, the Government should provide sufficient living space for these people. Not more than two people sharing the same room. These are the people who run our society. The workers, cleaners, drainage cleaners, maids, servants… All of these people belong to the slum areas. Have you ever thought of your life without these people performing various tasks for you and making your life so much easier? This entry was posted by Benzu JK on July 1, 2010, 9:12 am and is filed under Sustainable Design. You can follow any responses to this entry through RSS 2.0. Access to improved sanitation, Access to improved water, City slums, Definition of Slums, Development of the Slums, Durability of housing, Eradication of Slums, Eradication of Slums by providing Low cost housing, Five Elements lacking in the Slums, Life in slums, low-cost housing, Security of tenure, Slum dweller, Slum dwellers, Slums in Cities, Sufficient housing Area, The slum, The Slums, Urban slums, What are slums? Actually, aid won’t solve any problems. Poverty has been the norm rather than an exception throughout history. In order to increase the standards of living of poor people in third world countries, their Population Must Stop Growing. Our planet is facing Peak Oil… where the rate of crude oil production is decreasing every year, no matter how hard we try. Oil prices are increasing as a result. Its such a complex problem to solve as it was created over so many generations. But the basis of getting rid of slums has to have some kind of social currency attached to it, otherwise people unaffected will continue to do nothing. There is no economic gain to those with money so the motivation for change has to be more altruistic. But regardless of what’s done, or how efforts may come about, how do you get so many people to follow along with any type of plan that will take many years to successfully implement? Slums can never be eliminated. Social welfare programs to eliminate slums have always failed miserably because such programs encourage more people to move to slums in hope of getting free housing from the government. I would say my dream and desire is to erradicate poverty and help the needy in India,but unfortunately i am not that wealthy to do it because i’m from a middle class family but i wanted to do some thing in which these crisis would vanish away,i know central government have implemented the programmes and enhanced the state towards the development of slum areas by 4 to 5 years but its too long for the people suffering in the slums, my suggestion is to implement the programmes as soon as possible.when it is difficult for the people to earn for their livelyhood then it is very difficult for them to lead their lives, this is not the problem which occured recently there are slums which are existing since many years.why the government is not in action since then. Where monopoly or oligopoly markets are exist, government never through the slums(lives) from country. I think today no one can think of the true communalism even in china also. so self help is the only way to get over from the disease called “slum”.